Having a good jogging stroller is the big convenience that most of parents should prepare for their babies. There is a great number of jogging strollers available on today’s marketplace. They could be found in different colors, shapes, sizes, features, brands, and more. In order to narrow down your searching, we gladly present Joovy Zoom 360 Red Swivel Wheel Jogging Stroller as one of the best recommendations. The model deserves to rank 4 out of 5 stars for its excellent performance. Explore all of its gorgeous features now. Joovy Zoom 360 attempts to deliver a variety of color options to users, including blue, black and red. Among all of them, red color is a favorite option for most of parents because it can remain new appearance for long time. The basic feature of this stroller is a swivel front wheel to enhance its usability in busy roads and cities. Coming with 600D water resistant fabric, it makes cleaning the stroller become extremely easy and simple. In the normal condition, this stroller weighs 26.8 pounds, the largest single baby jogger on today’s marketplace. It can withstand a child up to 75 pounds in weight capacity. The stroller frame is made from aluminum, which improves its compact design in an effective way. You don’t have to worry about its storage. The tool takes less space to store thanks to folding feature. As a result, it fit most of car trunks. In comparison with other rivals in the same category, Joovy Zoom 360 comes with higher seat position to offer clearer view to your babies. There is carrying strap to gather different parts of the stroller together. Find out all you need when taking advantage of Joovy Zoom 360 Red Swivel Wheel Jogging Stroller. It not only focuses on eye-catching design, but also the plenty of gorgeous features to do multi-functional tasks. First off, one of the most important features that we had better mention here is its remarkable safety to your babies. The jogging stroller equips a great number of safety features to protect small users on different terrains. There is a five point harness to protect your babies from falling off the seat. Let’s select the suitable hardness to improve clear visibility of your children. The running leash combines well with the stroller base to stop its rides when necessary. A great benefit of this tool is that it offers large canopy to protect your babies from daily weather conditions. For a long walk, comfort is an extremely important factor. With Joovy Zoom 360, you could be rest assured about its special ability to make the babies relax. It comes with well-padded and large seat areas to maximize the comfort. Children can take short naps due to 3 reclined positions. They are higher to provide better views for each time of moving. Shock absorbing suspension proves its strength in bringing the smooth rides to your babies. Besides, it is convenient to put your bulky belongings into the large storage basket. Two cup holders are responsible for keeping your mobile phones and keys. How convenient it is! One of the best choices to purchase baby products in general and Joovy Zoom 360 in particular is selecting them from Amazon.com. It is a big deal for you to order your products through this online method. This guarantees to provide discount price as well as appealing promotions that are hard-to-find at other purchasing ways. 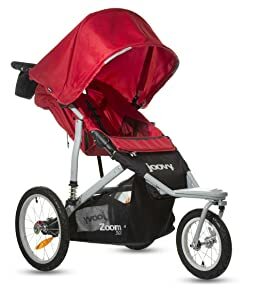 All in all, Joovy Zoom 360 Red Swivel Wheel Jogging Stroller is a must-have stroller for families with babies. It is very safe and comfortable to help your babies have fantastic outdoor experience. We ensure that this advanced stroller is an ideal option for most of babies at different ages.